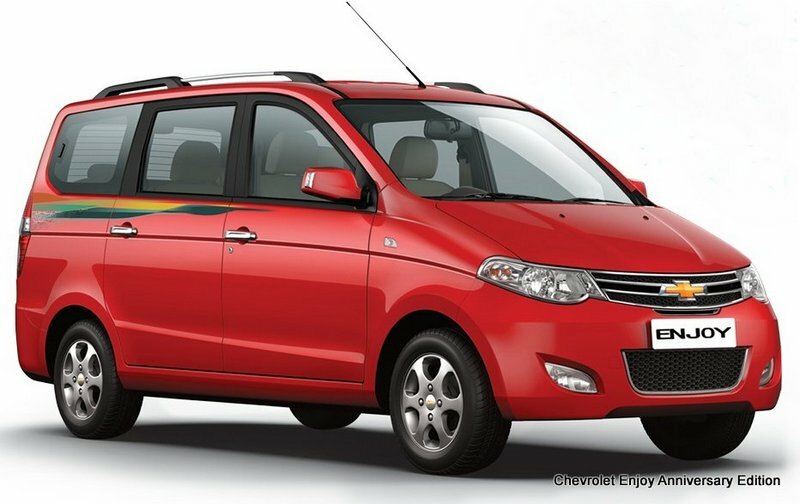 I have an eye on this Indian MPV for some time now, as I thought it could be convenient for me in both ways: as a passenger in front seat and taking away the wheelchair in the boot and another was to climb into the car along with the wheelchair by using a ramp. Currently we own an SUV and what’s the problem I hold with the car was except my brother, no one can put me into the seat and would be much difficult if try with others. We are using Mahindra Scorpio for nearly 8 years and before my fracture in femur (Oct 2013) things were fine and I was able to stand for a while for my father to lift me into the seat. But now I was depending on my brother every time to use the car and I have to drop plans many time because of his unavailability. Due to this we bought a hatchback (Suzuki swift) to movie around the city, but being a second hand car it gave us many trouble and we are force to sell it. Because of this I have to miss many chances of going out and to keep this away I was looking for an alternate vehicle and found Enjoy will be suitable for me. Keeping my new wheelchair in mind and the reclining seat option; I thought Enjoy’s high roof and low chasses will allow me to access inside the car without getting down from the wheelchair. And Enjoy’s sedan like seating will allow my father/mother to transfer me from the wheelchair to car seat without looking after my bro and the huge boot space will accommodate the wheelchairs easily. But to confirm this I really wanted to check the vehicle personally and thus booked for a test drive. The car was in front of the home within 2 hours of booking and I eagerly went out to explore the vehicle, though it started to drizzle and before it turn showering dad transferred me into the front seat. My brother took the steering and dad climbed into the 2nd row of the rear seat and the company persons get into the 3rd row and we went for a drive around the Besant Nagar. My first impression once got into the car was the wide windshield with great visibility all-round and the door windows are also big enough to get nice views, light and wind if unrolled. 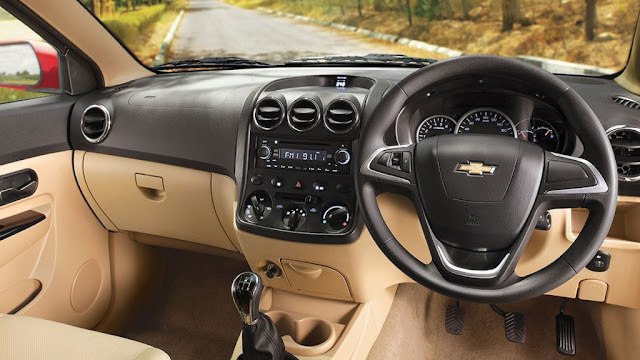 The dashboard was very similar to a car than an MPV and has an impressive dual tone interior and reaching the dashboard and the controls on them where handy. The door armrest exactly comes under my elbow to support rather hitting the elbow like in Toyota Innova. The front seat has spacious leg room even after pulling the seat to maximum front. Though the seat is soft and virtually flat (like the familiar Scorpio seat) rather deep bucket, I find mild discomfort with the backrest which I think could be resolved. 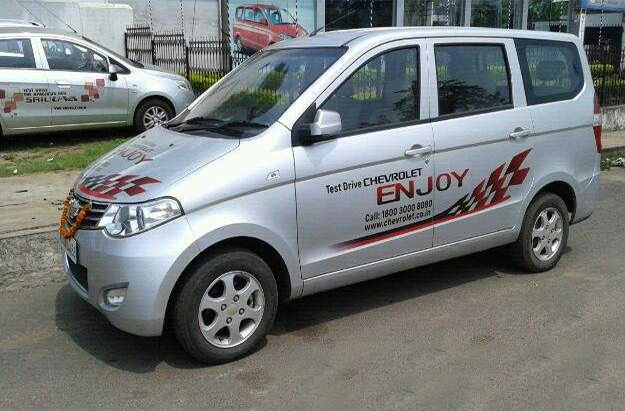 The Enjoy they brought was a top end diesel (1.3 LTZ 8 seat) equipped with dual airbags, Anti-Lock Braking System (ABS) and Electronic Brake-force Distribution (EBD), Driver Seat Adjustment, Alloy Wheels and Integrated (in-dash) Music System, along with many other security features and comforting things to move on. Being tall, my brother find little difficult at steering but the seat height adjustment and tilt option made comfort. The ride quality is really wonderful and cushioning and even on the potholes and speed breakers the vehicle maintains smoothness despite the small/midsize wheels (175/70R14) for a tall MPV. Though the diesel engine releases heavy noise outside, there’s enough calm inside once the doors are closed, which perhaps because of AC and the cooling coil come blower on roof makes the cabin chill in few minutes of running. 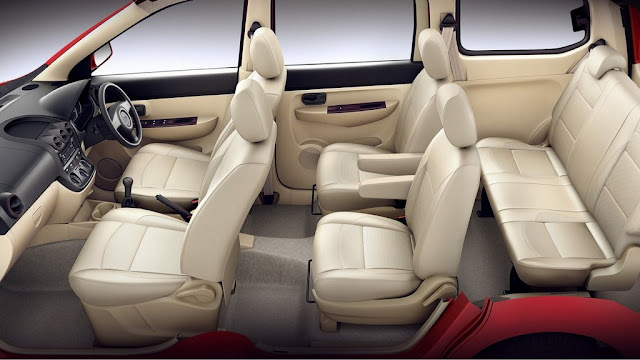 The Enjoy is almost the height of Toyota Innova but the seat height (from the ground) is lesser than Innova, so the headroom has more than enough space and anyone taller could accommodate the vehicle easily. Inside Enjoy no one could complain on views, because the seats of the second and third rows where higher than the front ones and has much spaces to stretch the legs. 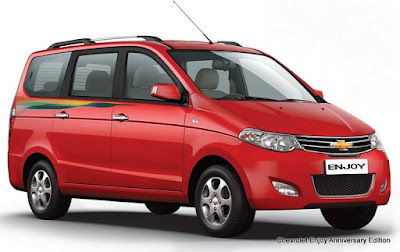 The sales manager who accompanied us revealed the MPV can touch 140 km/h steadily at reasonably 78bhp (petrol is 102bhp) and a mileage of about 18 kmpl (petrol 14 kmpl). Before returning the vehicle I want to check the inner height/width, so insist the company guy to open the boot and placed the wheelchair by folding the rear seat, which can be folded quite, but if removed the space could be abundant. Though the inner height is about 4 feet, sitting on the wheelchair (ordinary kind), it’s impossible to access into the car, but I still believe it’s possible with my new reclining wheelchair where I could lean back to travel for short distances. But for long travel, I could only place the wheelchair and other accessories at the rear and only 5 people could travel on the car. Being a low chasses (low floor) loading things into the boot is very easy esp. the wheelchair and also the person lift I bought for transferring. When I think again, overall the vehicle is adaptable for me, though many don’t like the look of the Enjoy (being boxy in shape) I feel it provides the comfort and space that not many stylish vehicles could give. We aren’t in hurry to buy the car, but were in serious consideration. During a long drive on the countryside of Kodaikanal, we stopped for mild refreshment and find this two pole gate making way through eucalyptus trees in the forest area. 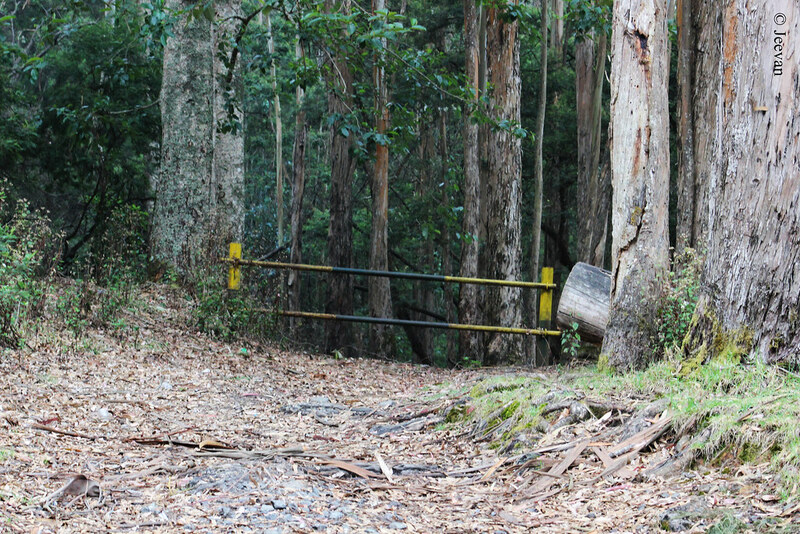 This is one of the many forest gates on way the to Mannavanur from Kodaikanal and these jeep tracks are open for only forest officials to patrol. Once crossed the Kodaikanal town, its woods and forest take away the scenario and this area is often sighted with bison (Indian gaur). Today’s post will have something more colorful, connecting two peace loving countries. Yes, I see the relationship between the Tibet and India exhibit through these photos and how well they coordinate to do their business. 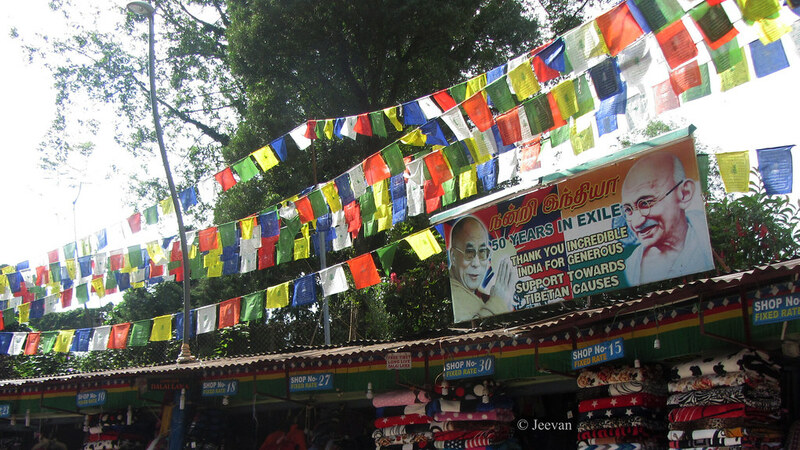 Below is an image carrying colorful flags above a row of Tibetan shops on the Kodaikanal Lake road. The shops that sells woolen clothes seems to have a fixed rate for their products, forming a Tibetan welfare association they work in a way of supporting each other. You could see a name board placed above the shop, thanking India for supporting the Tibetan causes with the images of the fathers of both the nations. 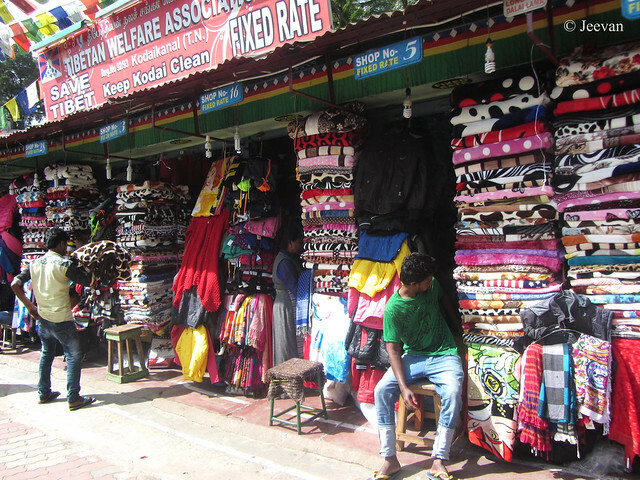 Above is another set of shops from the same array, bearing the board of their association and being a hill station most of their products are woolen blankets and scarfs to keep the nights warm and comfort. 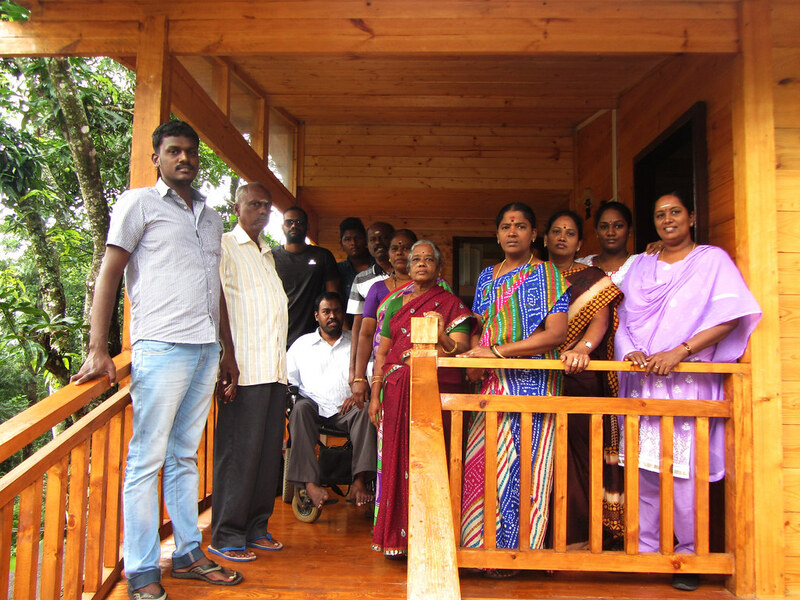 I had an awesome vacation last week (July 23rd - 29th) at my uncle’s woodhouse, aka Serene Woods, in Thandikudi, near Kodaikanal. It was my second vacation for the first time in less than 3 months times. Because only in the 2nd week of May I visited the same and stayed for a week with my family including two cousins and grandma, but this time it was a kind of get-together with couple of my aunt/uncle families, it was a celebration sort of moment. 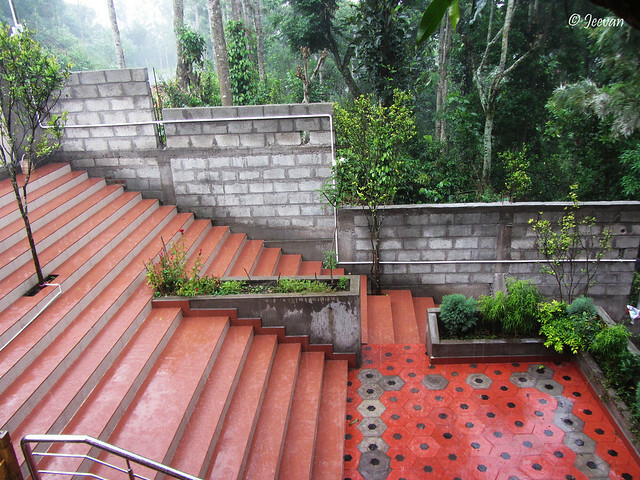 Last time I haven’t spent enough time at the woodhouse but was at much leisure exploring some nook and corners of the Kodaikanal Hills by staying there. This time I went quite blank to enjoy what comes my way and we spent most of the days at the wood-house/cottage, eating, sleeping, taking photos and chatting except a day drive to Poombarai. Last year my uncle organised a ceremony formally informing the built of the woodhouse and cottage but for some unspecific reason no one from our side (maternal aunt) could attend the event. And from then on, they are planning to bring us all there to compensate the event (even if they haven’t built woodhouse we would be somewhere together) or give treat to share their happiness. But before they could come up with a plan we landed there on our own and experienced the woodhouse and cottage that built amid the coffee, pepper and orange plantations. This was my 4th time visit to Thandikudi and second time stay at the woodhouse. Our journey started too late this time and reaching out the suburb (Chennai) took more than 2 hours – due to some traffic jams and detours – it was almost dark when reached the Serene Woods. The first day was spent quite at the woodhouse and cottage. It is a two story building with the ground and underground goes down the road and the woodhouse comes atop. But only woodhouse has ramp facility to allow me to stay there with much ease. The woodhouse contains a big hall and spacious two bedrooms with a king-size bed and a single cot on each room with attached bathrooms. 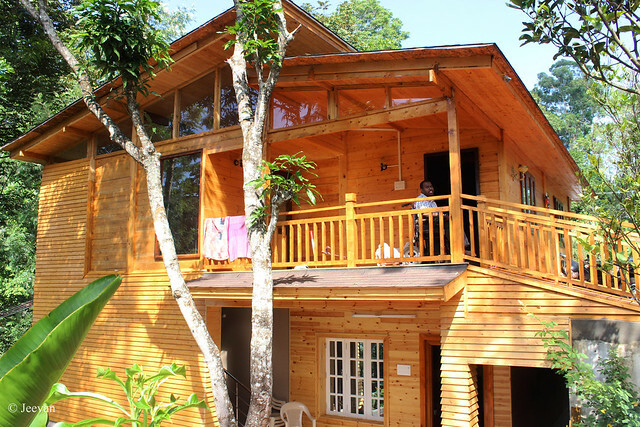 And it has a wonderful wide balcony overlooking the woods and wild vegetation on the backyard. The cottage on the ground beneath has a similar partition with a veranda and open staircase come steps gallery to sit, chat and retreat along a bonfire pit in the courtyard. The underground holds the kitchen and room for the caretaker and the cook. The cottage has a parking facility and space to park two big SUVs. We were 14 people in two cars (Innova and Scorpio) took charge the woodhouse/cottage for 6 nights and 5 days was blissful. Except day one we experienced rain daily. Though it rained almost every evening, the weather was wonderful throughout with bright sunshine in mornings and chirping of birds (in different notes) at the dawn and dusk become my favorite moments. It was cheerful being together with cousins, uncles and aunties and cooking ourselves what we like, despite have a cook, and it was indeed enjoyable sharing the moments at nature’s lap. Just for a day I was brought down to the ground floor cottage, as I haven’t been there, and we had a small bonfire celebration at night. It was refreshing to watch showing around the woods from the balconies of the wood-house kept enchanting. The last day was spent at the premises of the Thandikudi Murugan Temple; since it was a special day at the temple, leaving our parents there we (cousins) went on and off the area and had the lunch at the temple itself. Being to Thandikudi for forth time, the landscape becomes familiar to me but still hold breath with the transformation happening through the mist wrapping the peaks and mountains. First time experienced mist outside the woodhouse and at night the effect seems fabulous in the presence of night lamps, illuminates the cottage around. 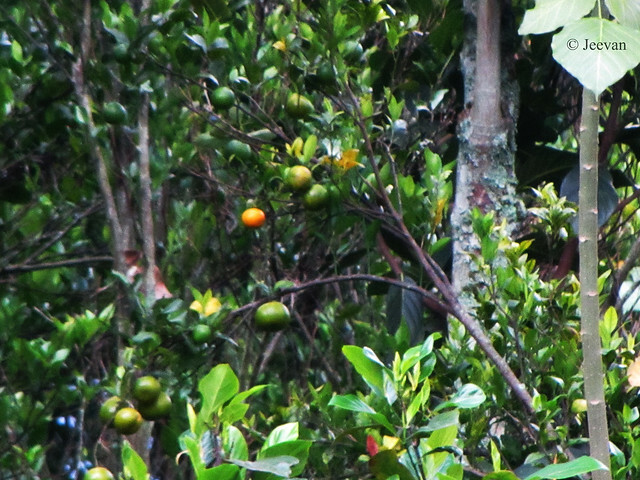 Since it was the beginning of Orange season, I could see the orange trees in the vicinity thrives in green and yellow. The Serene Woods is facilitate with the facilities of a home, including free Wi-Fi, television and power generators to make feel comfort and connected! But overall I enjoyed the natural environment and being together with dear ones.